After a sleepless ferry sailing (1:30-4:30 am) on Saturday morning we breezed through Blenheim to pick up John and Heather before making our way to Lewis Pass. The people at the Maruia Springs Thermal resort minded the Transit Van ($30). 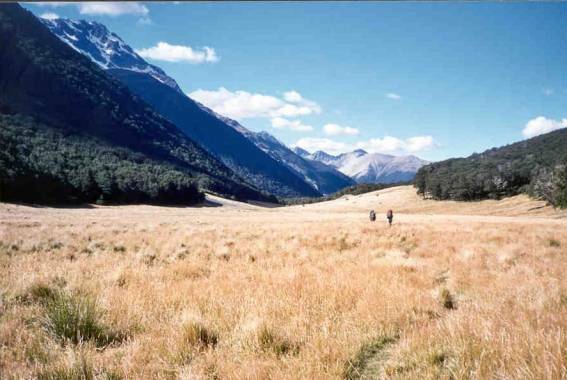 We wandered for 2 ½ hours up the Cannibal Gorge Track through a lot of very pleasant Beech forest, across some slopes that are subject to avalanches in winter and along some sunny golden-grassy flats to the large, tidy Cannibal Gorge Hut. Someone should run some deer through to eat down the grass! Yes there has been cannibalism there in the past. One Maori tribe celebrated victory over another tribe by feasting on them. 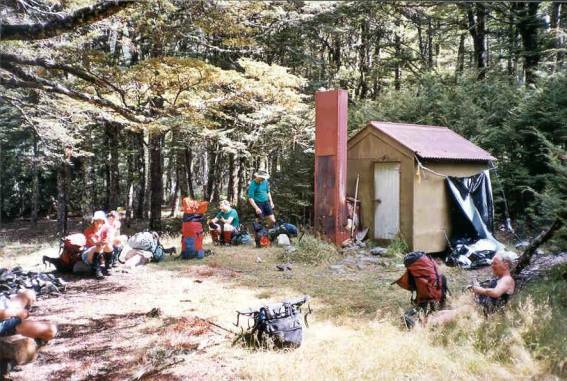 70 minutes further tramping up the Maruia saw us at Ada Pass Hut where we stashed food for our last night. 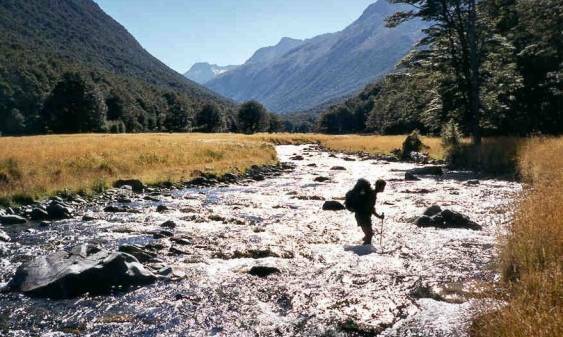 Then it was over Ada Pass (998 m) and into the Ada River and the St James Station. There was still quite a lot of nice forest walking here, with a few large grassy clearings. After 2¼ hours walking, we found a campsite by the river in an avalanche zone, about 4-km before Christopher Hut. The snowy peak of Faerie Queene loomed over us. Sunday was sunny again as we made our way to Christopher Cullers (45 min) and then Christopher Hut (15 min) for morning tea. 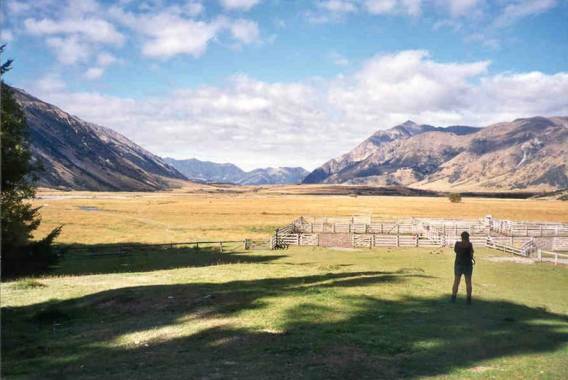 We were now on the wide, golden-grassed flat valley of the Ada River and the going was easy. Lots of photos were taken throughout the trip, as the views were wonderful. 45 minutes down river Bev’s sisters-in-law turned up in the Landcruiser and we all climbed in the back with the dogs to be driven first to the Ada homestead, and then up the Waiau River for some 14 km before we stopped to have lunch with them and a swim in the river. From here on it was by foot again up the Waiau River, to Caroline Bivvy (2 hr) for afternoon tea – this was all easy going, and then up to the Forks campsite for the night (2 hr) after a 39 km day. This section was a bit slower as the terrain got slightly steeper and rougher. The campsite in amongst the last stand of trees was excellent, especially given there were no sandflies and they really didn’t bother us much from thereon. Some people had not reset their watches the night before (daylight saving) and thus for the rest of the trip there was confusion and disagreement about times. On Monday morning (sunny again damn it) we started climbing seriously up towards Lake Thompson (1700 m, 2 ½ hr) and Thompson Pass (1796 m, 20 min). The track skirted around a couple of good-sized waterfalls and we were then on our way up the fault line to Lake Thompson. It was all pretty straightforward and easy going – nothing dangerous. The lake is quite spectacular at 340 m long and 170 m wide and who knows how deep. It was also rather cold – trip leader dived in and jumped right out again. After a morning tea boil-up and a bit of sunning we climbed 100 metres up to the top of the pass through one or two patches of snow. The view over into the D’Urville valley was spectacular and the Upper D’Urville Pass looked a long way away. But our route down off Thompson pass was our immediate problem – this being our only navigational/terrain difficulty of the whole trip (We have decided that next time we will try a different route down off Thompson Pass). We followed the instructions on the DoC leaflet and soon adrenalin levels were up, faces were white and we were bluffed. Eventually we found the route down (not safe in the wet or on ice) off the bluffy bit and sidled round to the tarns, below Upper D’Urville Pass, for lunch. Going up and over this pass was easy and we eventually made our way down to the tree-line campsite in the East Matakitaki River after a 9 ½ hour day, 6 hr from Thompson Pass. There were lots of South Island Robins in the Matakitaki valley – they were very inquisitive and followed us around the campsite, not allowing us any privacy. Tuesday saw us trundling down the easy-going East Matakitaki River, after applying copious quantities of sun block, to reach East Matakitaki Hut (3 hr) for lunch after which we made our way to the very tidy Bob’s hut for the night (4 hr). We crossed a three-wire bridge on the way to get across the West Branch of the Matakitaki and for the 90 min after this it was a bit of a climb and a sidle through the forest before dropping down onto the river flats to the hut. 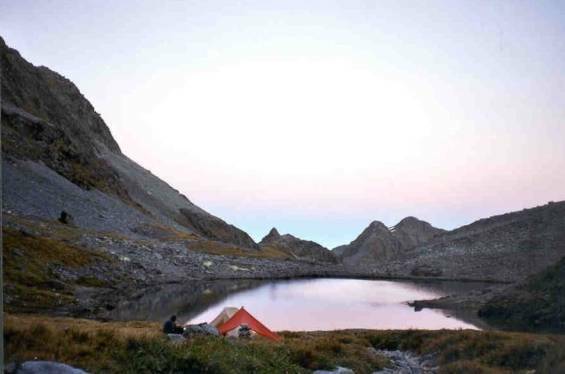 Because we had saved a day by use of the Landcruiser, we decided to take two days going over Three Tarns Pass. 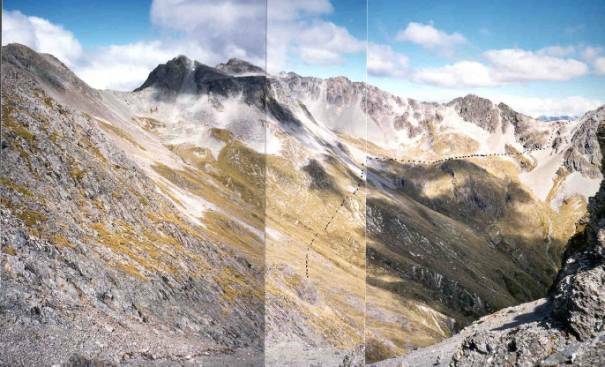 So on Wednesday we took a six-hour day to climb up to the three tarns up the West Branch of the Matakitaki River. Excellent travel again and two of us tried going up the little gorge which was fine given the low water levels, but we had to climb out at the waterfall. It was quicker to go around the gorge. 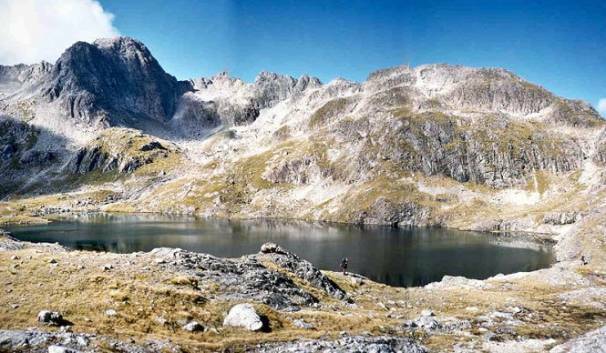 By 2 pm we made it to the three tarns (1710 m), the largest being about 80 m long. We swam in the smallest of the three, which was about shoulder deep. Some of us had to build stone piles because we didn’t have tent poles for our flies. After that we spent the afternoon watching Neville climb up to the rim of the basin to look for a route to Gloriana peak. He didn’t find one, and the following morning the party that tried for said peak was also unsuccessful. So on Thursday we didn’t leave the three tarns until late morning and stopped for lunch at the tarns on the Maruia valley side of Three Tarns Pass, which is not the lowest route over the rim wall but is recommended. These tarns were also excellent for swimming and from the brim of the basin we could see all the way down to the Lewis pass road and to Ada Pass hut. Some of the descent to the hut was steep-ish and at the bottom there was some light bush-bashing, but we made by 3:30 pm (4.5 hr), collected our food stash and headed on down to Cannibal Gorge hut for our final night. Neville still had lots of jellybeans left, them having constituted the majority of the weight in his pack. Hmmmm! The final excitement for the trip was when the tourist was arrested and hustled off the ferry, which delayed the final ferry sailing by 90 minutes while Police searched for his luggage!